Many contemporary houses have a mudroom as a secondary entryway that can make a big difference year-round if well organized and cleverly decorated. Mudrooms can be incredibly efficient at keeping the house clean and tidy. Icy or muddy boots? Wet umbrellas? Soggy coats? Not a problem! Well-designed mudrooms will have a place for them all and if well-planned will provide welcome storage space as well. The best and most efficient mudroom ideas will not only make yours look and feel warm and welcoming, but will be very efficient too and include crucial and smart elements such as durable and easy to clean tile or linoleum flooring, a comfortable bench to sit on while taking your boots or shoes off, a closet for equipment, utility and cleaning supplies, and racks and hooks to hang hats, coats and scarves. Some mudrooms even have laundry machines and a sink, which can be really useful. 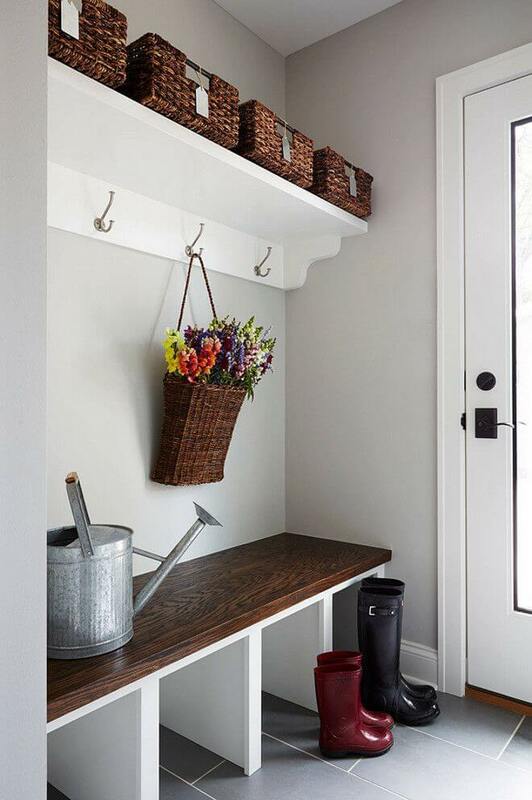 Mudrooms can be organized and decorated in many different ways. Whether you like traditional, transitional or modern decor, the best designs are functional, clean, neat and beautiful. 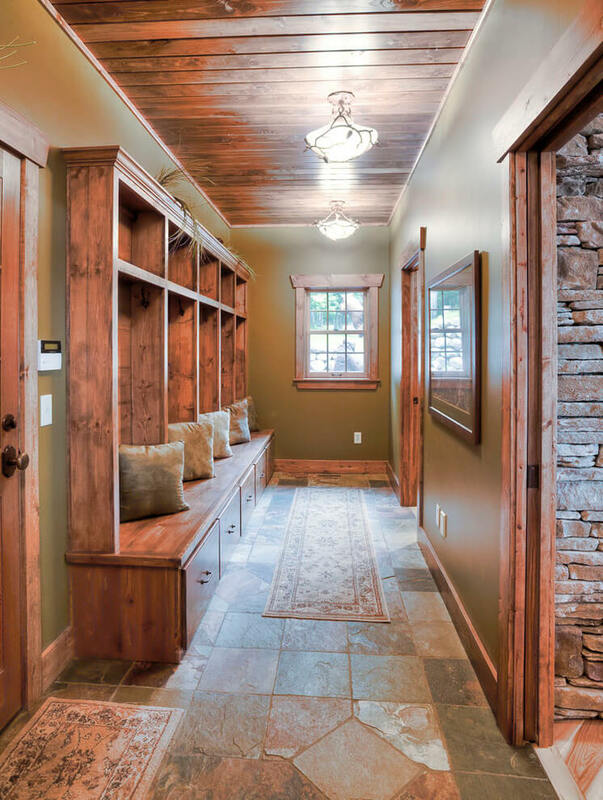 Get some inspiration from the following compilation of wonderful and varied mudroom decorations, and make yours both practical and welcoming. This charming mudroom optimizes space by placing a bench in a window bay and placing floor and wall cabinets around it. There is even a one-drawer floor cabinet beneath the bench next to partitions that hold other needful items. The color scheme of teal cabinets and batten boards, cream wall, ceiling, window frame and shades makes the area an even more comfortable place to be. 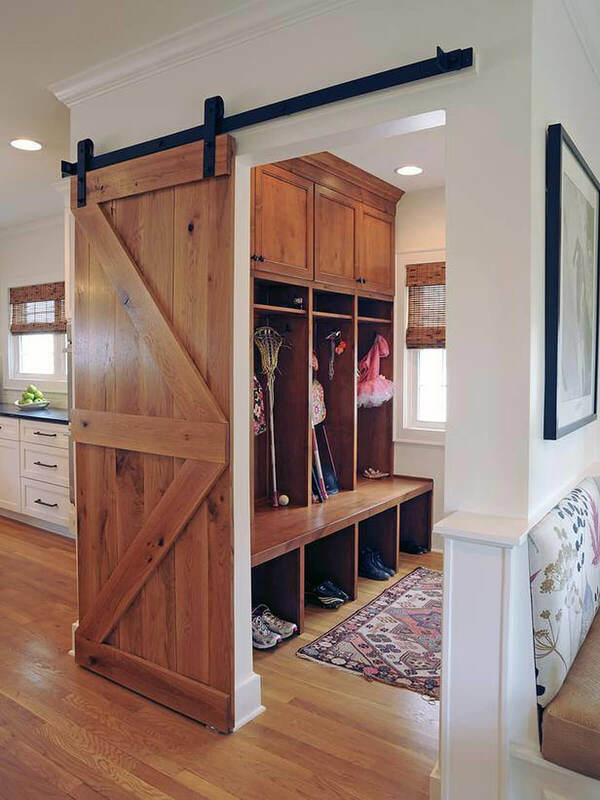 The use of a barn door is one of the better mudroom ideas. These are basically rustic slabs that open and close on rollers. 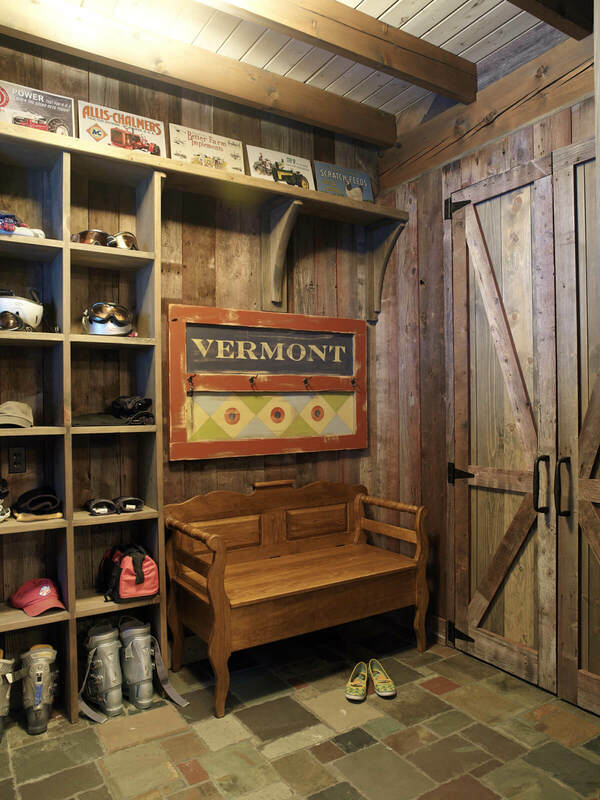 The rich color of this wooden barn door is mirrored in the floor to ceiling storage area in this mudroom and even in the roll-up shades on the window. The effect is softened by an Oriental area rug in muted pastels and the glow given by recessed lights. In some mudrooms everyone has their own personalized storage area. The cabinets in this mudroom have been painted with chalkboard paint on which the owners have not only written their names but contributed some artwork in chalk. The bold stone tiles on the floor add heft to the white and yellow color scheme. 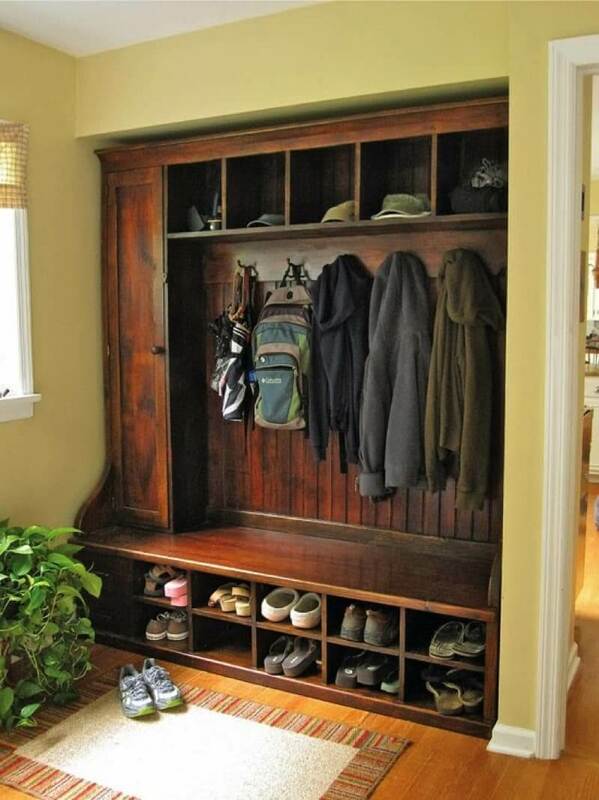 Another of the worthy mudroom ideas uses repurposed wood. This type of wood is left over from buildings such as barns and warehouses that are no longer in use. Used here, it gives the space a sort of old west look, sign over the bench proclaiming “Vermont” notwithstanding. Earth colored stone tile echo the dark colors of the doors and tolerate heavy, muddy traffic. Don’t be afraid to go for bright colors in the mudroom. 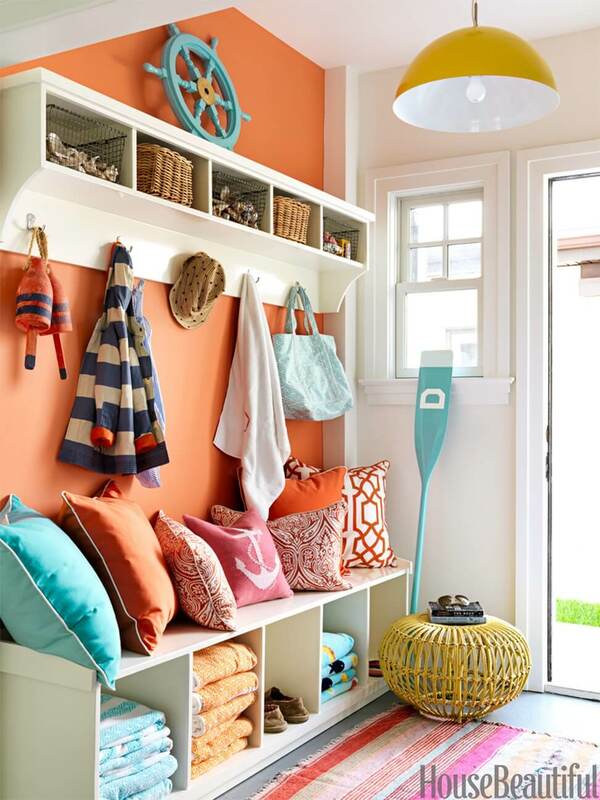 This maritime mudroom has one bright orange wall, colorful bench pillows and colorful beach towels folded in the cubbies beneath the bench. The lovely rug comes in shades of pink, red and blue. Natural light through the small window and the door makes this a room to linger in. 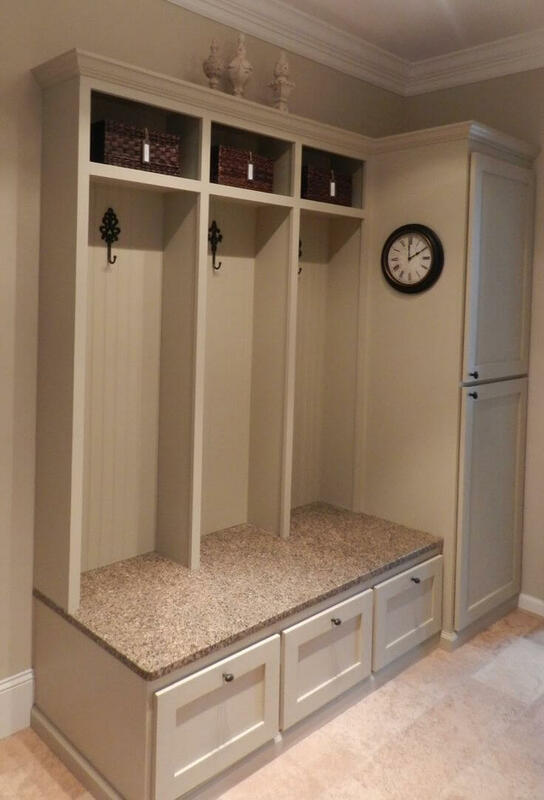 Some good mudroom ideas are to make the storage areas symmetrical. 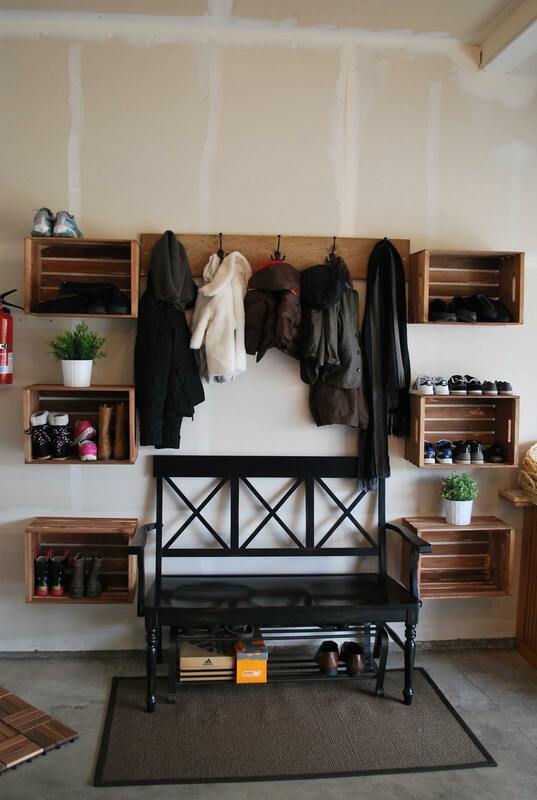 This mudroom features identical crates fastened to the wall on either side of a bench and the clothes hooks above it. The crates are just big enough to hold child-sized shoes and boots, while the hooks keep their coats and mufflers tidy. The rack beneath the bench is for grown up footwear. The warm color, affordability and somewhat primitive look of rattan has made it more and more popular in places that needs lots of storage. 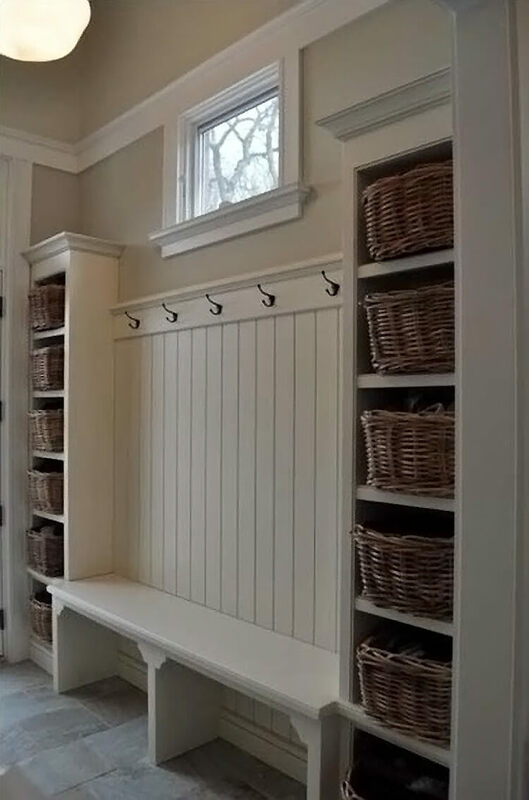 In this simple mudroom, bracketed cubbies hold rattan boxes, while hooks beneath them hold roomy, woven rattan bags. The soft brown of the rattan contrasts beautifully with the pale gray of the rest of the decor. Clean lines that are softened by bright colors are another of the worthy mudroom ideas. In this room, the angles of the black door, white framed windows, the bench and the wooden wall cabinets are softened by the colorful pillows, bags, rolled up beach towels and the blue and white pattern of the rug. 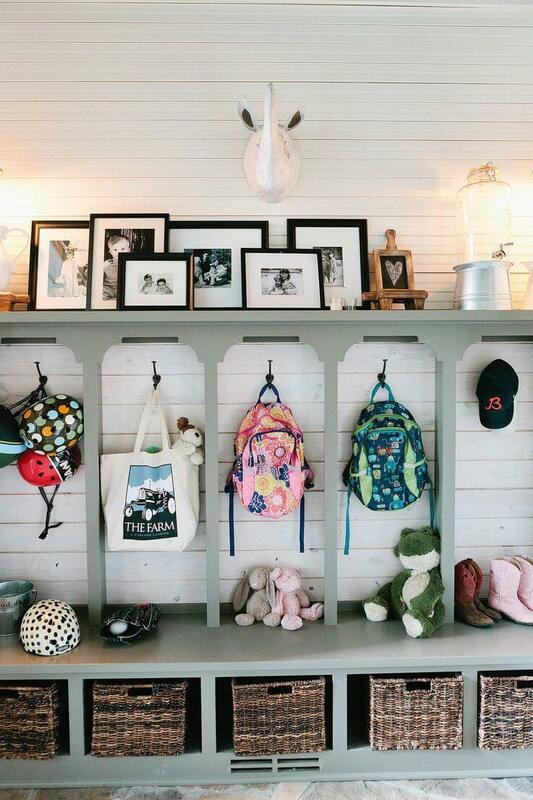 A variation on one of the mudroom ideas is this space, which not only has the name of the kids above the places where their backpacks hang, but a huge and happy photograph of said kids above it. One wall has been painted entirely with chalkboard paint for messages. The varnished red-brown wood of the floor keeps the color scheme from being too monochrome. One of the good mudroom ideas is to keep it simple. The pure white shelf in this room has space for rattan baskets with name tags attached and hooks to hang clothes or even a rattan basket full of bright flowers. A polished wooden slab with space beneath for boots serves as a bench. The slate gray floor and gray walls balance out the wood and the bright whites. Some homeowners may be wary of wallpaper because of the humidity a mudroom may be subjected to, but they shouldn’t be. This mudroom sports monochrome but cheerful wallpaper full of birds. Its color scheme goes well with white cabinets and cubbies and black bench seats. The exposed wood beam and industrial pendant light are focal points of the room. 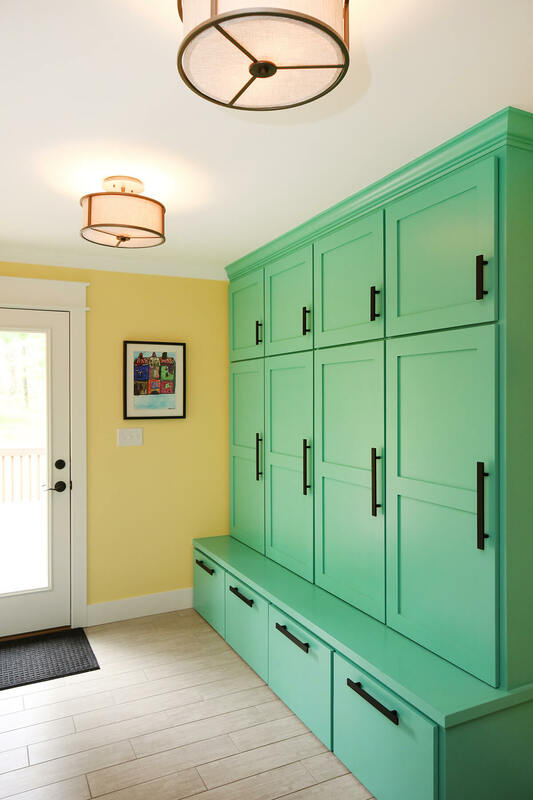 Another brightly colored mudroom features lovely, floor to ceiling green-blue lockers with bar pulls and doors with recessed panels. The wall is painted warm yellow with white trim. The floor is laid with cardboard gray planks that complement the brightness of the lockers. All is lit by hanging lamps with drum-shaped fabric shades. This ruggedly masculine storage area has top cubbies for hats, hooks for coats and backpacks and bottom cubbies for footwear. It is softened by the yellow wall, white doorframe and the pastel rug on the floor. A potted plant brings a touch of nature into the room. One of the more creative mudroom ideas is to place screens in front of the storage areas instead of solid door covers. In this unit, which doesn’t quite reach the ceiling, there are cubbies that hold baskets for toys and sports equipment, while backpacks and other items can just be seen through the screen. Cubbies below hold shoes. Bright white storage compartments contrast beautifully with the dark, almost black wood of the bench and the floor. The very top compartments hold hats, the compartments beneath hold rattan baskets, the larger third area has hooks to hang coats, hats and bags while the bottom spaces under the bench are for shoes and boots. A mudroom can not only be attractive, it can be downright elegant. The homeowner uses tan and gold marble for the bench seat above deep shelves for storage. A similar marble is used for the floor. Even the coat hooks are ornate. Yet a simple clock on the side of a cabinet is the focal point of the room. Using unexpected colors is becoming one of the more popular mudroom ideas. 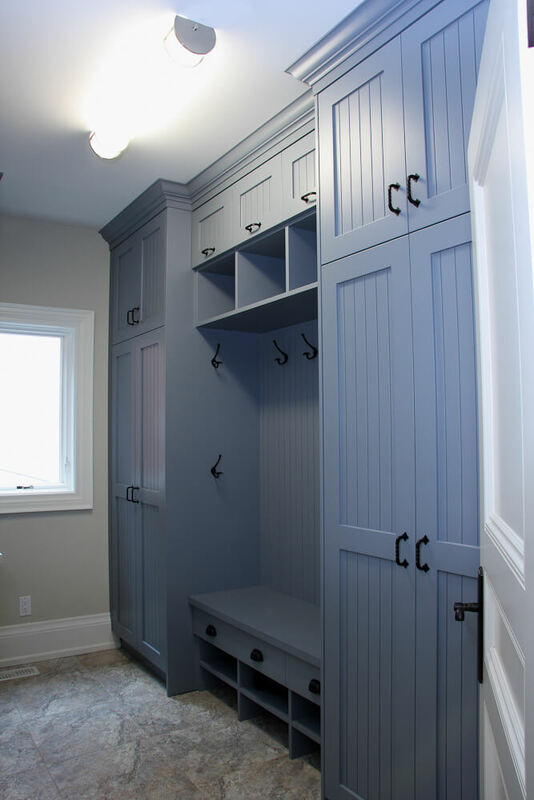 In this mudroom, the storage space, which includes cabinets, cubbies a bench with storage and hooks for hanging items is painted a pensive cadet blue. This goes well with the taupe wall and the stone floor whose colors echo the color of the wall. Another of the good mudroom ideas is to make the space look artless. This simple room has white shiplap walls, hooks, a rough hewn bench, a sturdy coir rug and that’s about it. Family and friends just toss their stuff on the hooks, kick their shoes under the bench and come on inside. A mudroom can never have enough baskets, and this mudroom has shelves made for a group of identical woven rattan baskets to hold swimsuits, toys, shoes or whatever the family needs. They are separated by a long, elegant bench with a beadboard back that holds coat hooks. Natural light enters the room from a high window. 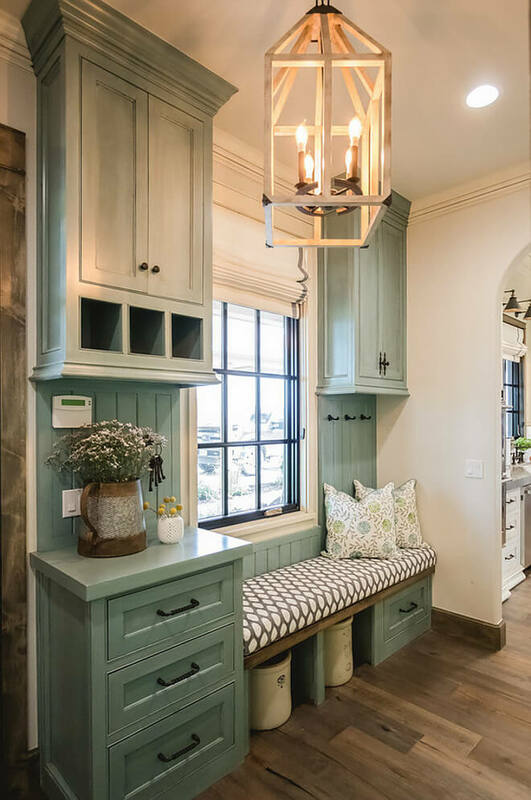 This mudroom also has a bench with storage space, but in this case there is actually an arcade attached to the bench where each family member stows their stuff. The arcade and the bench are both painted gray green, while the wall behind them is white. A lovely touch is family photos grouped on top of the arcade. 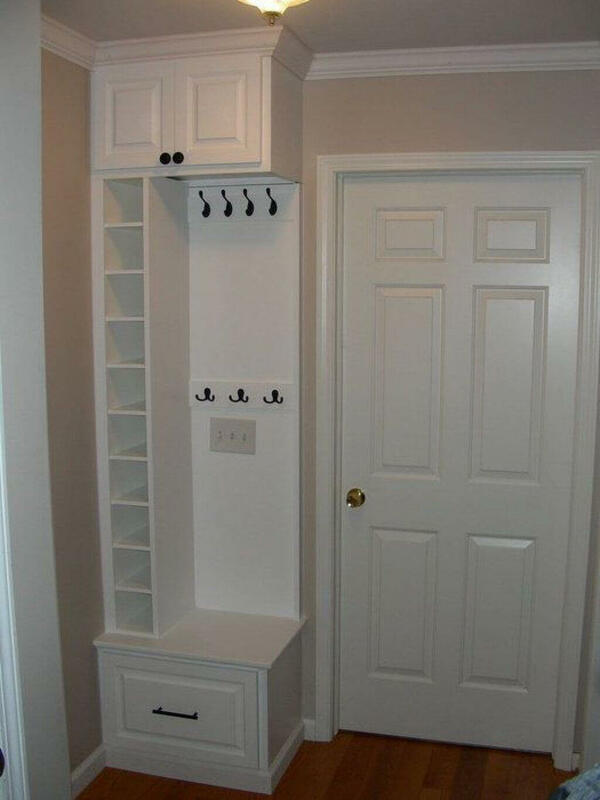 Built-ins are one of the other worthy mudroom ideas. In this fantastic mudroom, the uilt-in storage space is made out of a pickled wood that is repeated on the window and door frames and even the ceiling. All is softened by the pastel runner on the stone floor, the pillows tucked into the recesses and the glow of decorative milk glass ceiling lights. A homeowner who doesn’t have a whole lot of space for a mudroom but wants one anyway needs to get creative, and so it is with this space. A floor to ceiling storage space features a cabinet on top, a series of cubbies to the side and groups of hooks beside it. A tiny bench, almost square, is just enough for one person to rest on. 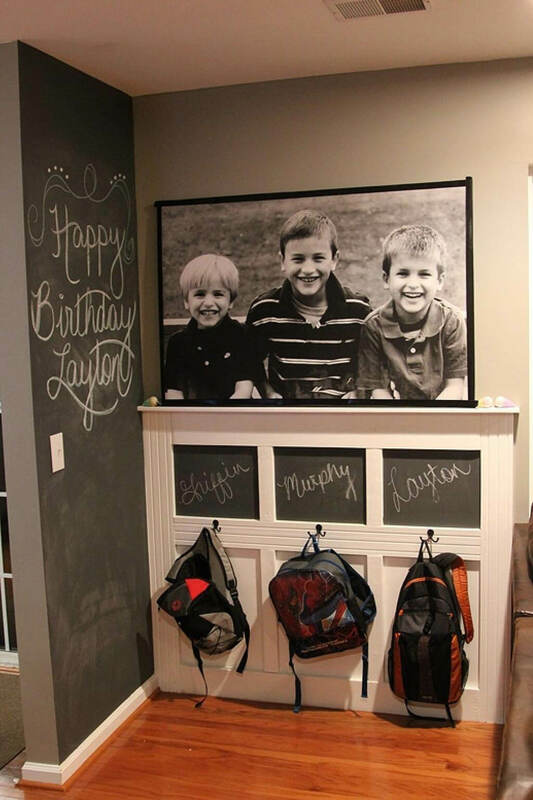 The chalkboard in this mudroom is more than just decorative, for it is no doubt used for messages. Beneath it is a simple cabinet that holds galvanized metal baskets. 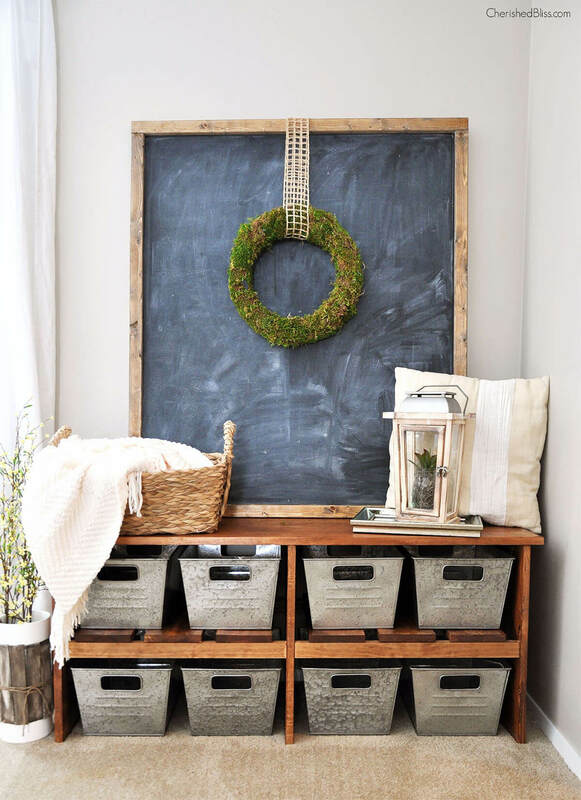 The hardness of the metal is mellowed by the wreath over the chalkboard, the lantern, the basket with the soft blanket and a pillow.